- I received almost equal dividends for my S&P500 and Emerging markets ETFs ($ 159 and $190). 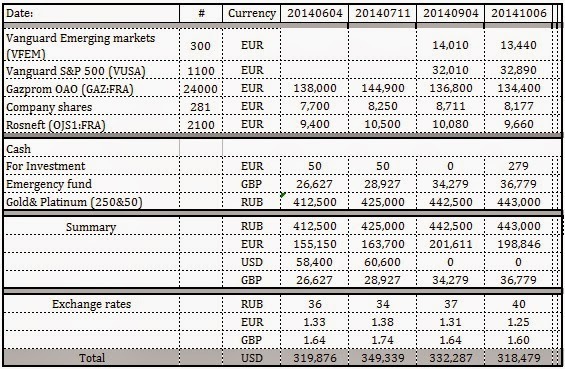 However, S&P500 costs $41,110 and Emerging markets $16,800. This represents 1.5% annual dividends for S&P500 vs. 4.5% for the emerging markets ETF. - Euro zone struggles significantly in comparison with the USA. Exchange rate is lowest in 2 years, while British pound is at is lowest for the last year. RUB is dropped to new low as well. European Union countries keep arguing with each other and imposing sanctions on the neighboring countries, which does not help the recovery from the crisis. - Dividends wise from the current portfolio I am getting are $8,500 or 2.6% annually after taxes. This is currently covers about 10% of the annual expenses. - With only two months to go I will be short of $44,000 of my annual financial independence goal at the current portfolio condition. It looks like Europe is really struggling. At least you have the $8,500 passive income to help you with yearly expenses. That's good. Thank you for stopping by. I agree that it does not look pretty and it is not what I was hoping as well. On the other hand even if I reached by annual goal of $370K, the dividends would stay the same. So there will be some moral satisfaction but literally no gain, towards financial independence. Even now S&P500 generates less below 2% a year, this is almost as high as inflation. I think the trend will continue, as my personal impression that there has been no recovery, only controlled recession. Governments and financial institutions elected not to change the business model, but continue to do it as usual, while injecting more paper money in the economies. In the short term I will be focusing on re-balancing portfolio and keep on working. I do not think there will be a short term solution towards my financial independence. I think it is a case of keep saving money for at least another 20 years.